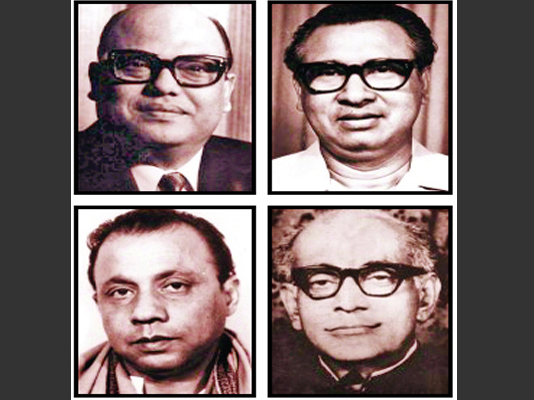 The nation will observe the mournful Jail Killing Day today by paying rich tributes to four national leaders and Liberation War heroes, who were brutally murdered inside the Dhaka Central Jail on November 3, 1975. When Bangabandhu Sheikh Mujibur Rahman was detained by the Pakistani junta, the four national leaders — Syed Nazrul Islam, Tajuddin Ahmed, AHM Quamruzzaman and Captain M Mansur Ali — led the country’s independence war. They were sent to jail after the gruesome killing of Father of the Nation along with most of his family members on August 15, 1975. The ambitious but comparatively junior and mid-level military officials with the blessings of the then self-proclaimed president Khondoker Mushtaq Ahmed, the most hated betrayer member of the Bangabandhu’s cabinet, killed the four national leaders in cells of the Dhaka Central Jail. The four great sons of the soil were shot dead following repeated bayonet charges on the fateful day, less than three months after the August 15 massacre. Syed Nazrul Islam was the acting president of Bangladesh government in exile during the nine-month sanguinary battle as the Pakistani military junta arrested the country’s founding father on the night of March 25, 1971 from his historic Dhanmondi residence soon after his formal declaration of independence. Being the prime minister of the government in exile, popularly known as the Mujibnagar government, Tajuddin Ahmed played a key-role in materializing the dreams of millions of freedom-loving people to establish an independent Bangladesh. AHM Quamruzzmaan and Captain Mansur Ali, close associates of Bangabandhu, were also in vital positions to formulate the policies and strategies of the guerrilla warfare against the Pakistan Army equipped with modern weapons. Bangladesh Awami League (AL), its associate organisations and other socio-political bodies have drawn up elaborate programmes to observe the day in a befitting manner. Marking the day, President M Abdul Hamid and Prime Minister Sheikh Hasina issued separate messages. In their messages on the eve of the fateful day, they paid glowing respect to the memories of the four great leaders. The AL’s programme includes hoisting of the national flag and the party flag half-mast at all party offices across the country, including Bangabandhu Bhaban and central AL office, at dawn, hoisting black flags and wearing black badges. Wreaths will be placed at the mural of Bangabandhu Sheikh Mujibur Rahman at Dhanmondi at 7 am. Wreaths also will be placed at the graves of the martyrs of August 15 and the three national leaders Syed Nazrul Islam, Tajuddin Ahmed and Captain Mansur Ali at the Banani Graveyard in Dhaka city in the morning. Special prayers will be offered and milad mahfil will be held there. To pay homage to AHM Quamaruzzaman, an identical programme, including placing of wreaths, offering of special prayers and munajat and milad mahfil, will also be held at his grave in Rajshahi in observance of the day. A discussion will be held at Krishibid Institution auditorium in the capital at 3 pm. Awami League President and Prime Minister Sheikh Hasina will chair the meeting as the chief guest. Besides, a milad mahfil will be held at 9am at the Old Central Jail where the four national leaders were killed. Family members of martyrs of Jail Killing Day will attend the programme. A milad mahfil and prayers will be held seeking eternal peace of departed souls of the four national leaders including Captain M Mansur Ali at Health and Family Welfare Minister Mohammed Nasim’s Dhanmondi residence.